Oftentimes when agonising over our gaming setups, it’s the visuals that take precedence, and understandably so – whether it’s a sweeping RPG or rollicking zombie shoot-em-up, game graphics these days are verifiably gorgeous, so why ruin it with sub-par sound? Our best gaming headsets are ones that not only keep you in touch with your mates during an all-hours co-op, they’re also ones that’ll enhance your playing experience more than simply using on-board sound. Looking for a headset specifically tailored to your Xbox One? Check out our guide to the best Xbox One headsets here. The big decision you need to make (assuming you’ve already come down on one side or the other of the great console debate) is between surround and stereo sound. Essentially, stereo features a separate channel for each ear, and has been around for a decent enough stretch of time that the quality is unbeatable. Surround, meanwhile, is either synthesised for a more atmospheric experience, but one that tends to be slightly diminished in terms of sound quality. However, in a word to the FPS players out there: find a headset with actual rather than virtual surround sound, and you may be pleasantly surprised. The other 50-50 choice you’ll encounter is between wireless and wired gaming headsets, but as this is fairly self-explanatory, we’ll get right down to it. Dolby 7.1 Surround is the grandaddy of surround sound systems, and in our number one gaming headset translates to a cinematic playing experience courtesy of seven simulated speakers (now say that three times fast). HyperX say the studio-grade sound stage (again with the alliteration) particularly excels in first-person shooter and open-world environments where you’ll need to keep an ear out for gunfire or enemy approach, and users attest to the overall sound, mic and build quality, saying they achieved huge sound without distortion. Compatible with PC, Mac and consoles alike – it comes complete with separate audio/mic leads for PC, and an interchangeable jack for everything else – this is our best headset for computer gamers from all camps. Reviewers loved the overall handiness of this headset, seen in the conveniently positioned and responsive volume control, the super simple plug and play setup, and the useful ‘raise mic to mute’ function, and they also had no complaints in terms of sound or comfort, commending the excellent voice isolation and breathable open-back design. Settling one of the most surprisingly divisive matters in gamerdom – leather ear cushions or memory foam? – this Asus headset says “why not both?” It comes with interchangeable ear pads to suit your particular preference, and offers “optimum clamping force” based on hilarious-sounding research into a wide range of head types. They’re said to be pretty good once you start playing too, boasting 7.1 surround sound engineered to render every sound with superb accuracy, and allowing players to identify exactly where belligerents might be lurking. If you have a smaller head and have suffered from slippage, resulting in losing your audio part-way through a raid, reviews suggest you might want to give this headset a go, as while those of more generous proportions might find the clamping pressure a little full-on, it’s ideal for skinnier noggins. That’s not all, of course: as well as reporting an easy setup and near-insignificant weight resulting in comfy wear, reviewers loved the swappable battery system, which meant they didn’t have to stop and charge their set mid-sesh. While sadly leaving the PC gamers out of the fun, we have to admit that the choice of on-brand Xbox and PlayStation colourways on the ASTRO A50 headset is a pretty cool introduction. As we know though, looks aren’t everything, so luckily this set has the substance to back them up too. That amounts to Dolby 7.1 surround sound, no-lag performance, clean voice chat courtesy of a precision microphone, and simple switching between console and PC/Mac modes – see, computer gamers? We’d never leave you out completely! 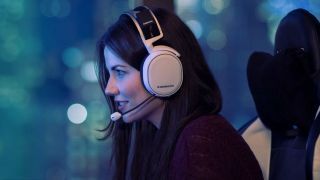 Our friends over at T3 called this Arctis gaming headset “one of the best gaming headsets available today”, and we’d be inclined to agree, what with that powerful Dolby 7.1 surround, consistently good noise cancelling and certified lag-free connection. But what’s really left users impressed is the comfort. Finally approaching marathon gaming like the extreme sport we all know it to be, these ‘phones feature performance fabric on their cushions for breathability and a ski goggle suspension headband for lasting supported comfort. It’s no use going for the convenience of a wireless headset if the battery is going to die on you mid-campaign, which is where the HyperX Cloud Flight headset comes in. With a choice of wireless or wired operation, detachable noise-cancelling microphone and PC-, PS4- and PS4 Pro-ready compatibility, the options for use are surprisingly many, and reviewers love the plug-and-play ease and cup-side controls. But of course, the big player is that 30-hour battery life, allowing you to go as long as your thumbs, and your own energy reserves, will allow. Put your new headset to the test in the spookiest possible fashion with our list of the best zombie games for all consoles.